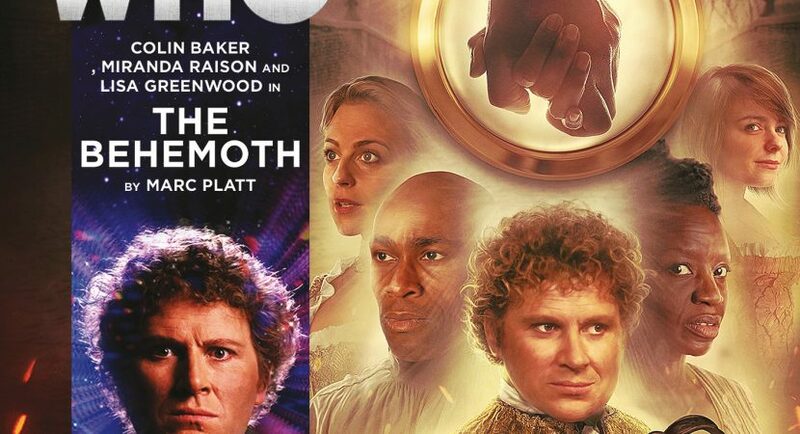 This is a good story and Sixth Doctor and it’s by Marc Platt, but somehow it took me several months to finish it. That’s partly because of slow pacing and RL interruptions, and partly because Flip spends a good chunk of it trying to fend off a creeper who made my skin crawl. The Behemoth begins innocently enough with the Doctor, Mrs Clarke and Flip mingling with aristocrats and enjoying diversions of the leisured class. For once, they’re even dressing up to blend in! The first half hour is light farce and mildly awkward mishaps. But you know our heroes: sooner or later they’re going to stumble across the grim underbelly of this hierarchical society and step in on the side of the downtrodden. If this story were set on an alien planet, we’d know the script. The Doctor and his companions would help the the underdogs and/or force the bigwigs to treat everyone more fairly. But that’s not always an option on Earth, which seemes to have a lot more fixed points in time than the average planet. The Doctor can’t change Earth history, any more than Babs could alter the Aztecs. Also, this isn’t some backward non-european culture in need of enlightenment by a white saviour (the one flaw of The Aztecs). It’s 18th-century England at the beginning of the Industrial Revolution. Class inequities, exploitation of cheap labour, bribery, corruption, racism, sexism and animal abuse are messy real-world problems that the Doctor can’t solve with a gadget. Impressively, this story touches on all of them, although it obviously can’t go into too much depth. In some ways, The Behemoth is The Aztecs crossed with The Peterloo Massacre (but thankfully without such a high body count; it’s the class issues not the plot that are similar). As usual, Platt comes up with some nuanced secondary characters. Even the frivolous Mrs Middlemint turns out to be more interesting than she seems at first glance, allowing the gallant side of the Sixth Doctor to put in an appearance. Sarah, a slave, and Gorembe, a runaway, provide sympathetic faces or at least voices for victims of the Triangle Trade. An abolitionist preacher and actual historical Dutchman provide counterpoints to the two main villains. Flip: Cripey! You’re on the run, aren’t you? Someone should look at the shackles on your legs. The Doctor would help! Gorembe: I cannot stay. There are many bad people here. While The Behemoth has many twists and turns, it boils down to a few rich Englishmen controlling and abusing everyone who isn’t. They’re not going to listen to Mrs Clarke’s outrage or tolerate Flip’s compassion for those they consider inferiors. Which leaves the two women angry but powerless, waiting for the Doctor to do what they can’t. Not that they don’t help where they can. But poor Flip soon finds herself needing help as well. She spends a good chunk of the story being a damsel in distress, albeit a very assertive and stubborn one. The Doctor’s role in this audio is a little maddening. He keeps wandering off, sometimes because he’s taking a well-earned vacation from being a hero, other times because there’s too many problems at once. He delegates some tasks to Mrs Clarke. On the one hand, it’s better Who when the Doctor relies on his companions’ competence instead of keeping them in tow as nominal “assistants.” On the other hand, I shared some of Constance’d exasperation when she kept having to chivvy him along. However, even when the pacing lags, there’s some really good actors in this story. Colin is making even the quiet scenes sparkle, as usual. The subplot between Sixie and Mrs. Middlement was surprisingly enjoyable, a much-needed bit of lightheartedness in a story full of grim truths. Also, I continue to enjoy the developing friendship between Flip and Mrs Clarke, who are not only complementary opposites, but whose contrasting accents from 2012 and the 1940s is really fun to hear. (Miranda Raison has a knack for sounding authentically vintage). I appreciated the fact that Mrs Clarke started from a place of privilege — she’s a little too blithe about working conditions for South African natives in her own day — but quickly came to be outraged that her fellow Englishmen were committing the same kinds of atrocities as the Nazis she was fighting against. Like Nyssa, she’s even more driven than most of the Doctor’s companions to right wrongs because of her background. Flip’s abduction was genuinely scary in a way Doctor Who generally tiptoes around. Companions suffer nowhere near the amount of sexual harassment and abuse they’d be subjected to in the real world if they were captured, imprisoned, and separated from friends as often as they are. I was edgy on Flip’s behalf all the way through, knowing what it’s like to be cornered. I’m afraid I was worried more about her than Sarah and Gorembe, which isn’t fair to them. The segments with Sarah and Gorembe on the plight of slaves were important and powerful. Sadly, I’m more ignorant of African than Australian traditions (and I’m only a little conversant in the later). But I trust the author did his research, since he certainly did so for Dreamtime. I hadn’t picked up on the fact that van der Meer and Lady Clara were real historical figures.